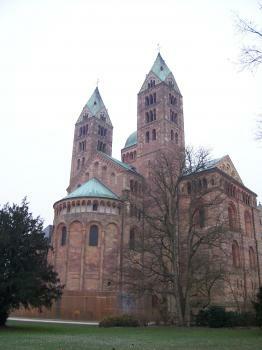 Speyer Cathedral is one of the most important Romanesque monuments from the time of the Holy Roman Empire. The cathedral (Dom in German) was inaugurated in 1061. Thirty years before, Emperor Koenraad II gave the order to build it. He wanted to honor a city of his choice with the biggest church of its time. This way Speyer was given the prestige of a real Royal Residence. In 1689 the cathedral was almost totally destructed. Until today renovations are under way to save the building and reconstruct the interior in the original Romanesque style. Its architecture is a combination of eastern and western influences. The total length of the building is 134 meters, the highest point is 72 meters. The Crypt is still the original, and harbors the graves of no less than 8 medieval German emperors and kings. They were buried there between 1039 and 1309. It includes also the grave of Emperor Koenraad II, who had to be buried elsewhere the first 2 years after he had died because the crypt was not yet finished at the time of his death. The stones of the Cathedral in Speyer have very striking colors: yellowish and several kinds of red. This, and the extraordinary shape of the building, make it a remarkable sight. The underground part of the cathedral is also worth visiting. There are the graves of Emperor Koenraad II and lots of other medieval Kings and Queens. You would not expect all this in a small German town, but it is really special. A church spire stands over the city upon exiting the Speyer train station, but it isn't part of the Speyer Cathedral. Instead, one has to walk just under one kilometer south down Bahnhofstrasse to Maximilianstrasse in order to see the Romanesque cathedral anchoring the east end of the street. The cathedral was begun almost 1,000 years ago, and is quite remarkable both near and far away. Sadly, I visited at the end of March this year, so the towers were not yet open for tours. Additionally, minor work was under way at the front entrance, which required an entrance from the side of the church. I had the cathedral almost all to myself (with just the cleaning crew) since I arrived just after it opened at 0900. Even though I'd already seen many churches in Germany in March, I really appreciated the sparse beauty of the nave. On the day of my visit, I was also the first to visit the vaults underneath the cathedral, where I had time to contemplate in silence the history of this cathedral, where eight German emperors and kings, as well as some of their wives, were laid to rest. Speyer Cathedral was one of Germany's first inscribed World Heritage Sites, and it is an absolutely beautiful and impressive sight to see. 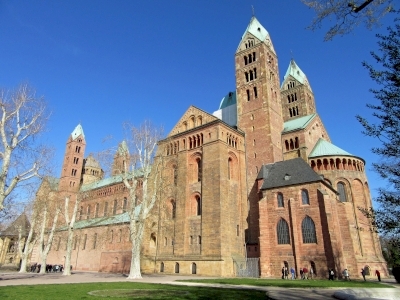 Logistics: Speyer Cathedral is within walking distance from the train station, which has regular connections to Heidelberg via the S3 rail line. Neither Germany in particular nor Europe in general suffer from a lack of WH-listed cathedrals, but the one in Speyer was one of the first on the list, and for good reason: it is the largest remaining Romanesque church (after the destruction of Cluny Abbey during the French Revolution), and really seems much too big for the relatively small town of Speyer. It was Emperor Conrad II. 's goal to build the largest church in Christendom, but why this location was chosen is not really known. Today it is mostly famous for being the burial place of a series of emperors and kings from the Salian, Staufer, and Habsburg dynasties, and the Imperial Crypt is still the most impressive part of the cathedral. The Imperial Hall above the entrance was to me not so impressive, but in general, this is a great site and an easy, worthwhile visit. The main part of the building is free for visitors but it’s worth paying the admission fee to see the Imperial Hall above the main entrance with its large artwork and climb one of the towers to the viewing platform with its vistas across the city. Be warned – there are a lot of stairs, but the perspective of the cathedral from the tower gives an excellent insight into the architectural design and external features. Inside the main part of the church, make sure you go down into the crypt to see the tombs of the kings. Also, there is often an art display at the back behind the altar with a mix of classical and contemporary pieces. Although larger churches have been built in Germany since Speyer Cathedral was first constructed, it is still a grand and impressive building. Once you consider all the history beneath its nave, it gives the site even more significance. 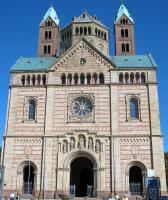 In 2008 I went to Speyer by train and explored this wonderful city all day. It is a really worthwhile destination for a trip, not only because of the cathedral. Speyer's history goes back to more than two thousand years. A thousand years ago, it was the centre of the Salian kingdom and therefore also of the German medieval empire. The day in Speyer was wonderful because the town is just beautiful and has a very special atmosphere. It is so historical and pretty, yet, it did not feel "touristy", but had a very original and down-to-earth feeling to it. We enjoyed strolling around and taking in the atmosphere, but we also visited two museums (the Technical Museum and the Historical Museum of Palatine), the old Jewish Quarter and of course the mighty cathedral. The cathedral itself is beautiful and impressive but it did not touch or strike me as much as others did. As previous reviewers have mentioned, it feels a bit sterile and somehow I expected it to be more exciting. Nevertheless, it is impressive and it is still worth a trip, all the more if you take some time to explore the town as well. 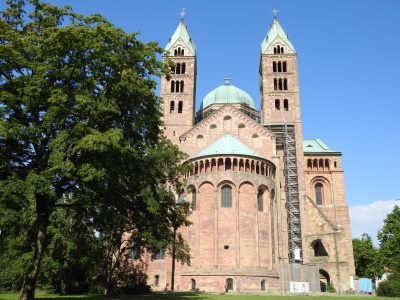 Opinions on the Speyer Cathedral vary considerably: either a marvellous example of Romanesque architecture or a bare and austere interior without any spirit. I must admit that the atmosphere inside is quite chilly indeed, but I like very much Speyer and its cathedral. The sheer size of the building is striking and also the beautiful location: free-standing and surrounded by a park, the views are not obstructed by other buildings. But maybe I'm biased, because I was born and raised in the vicinity of Speyer. I visited the Cathedral with my parents and my school class, and even as an adult I often make a detour to Speyer when I am in the area. The highlight of a visit is the wonderful crypt, it should not be missed (photo). It is considered the largest Romanesque columned hall, it extends under the entire transept and chancel. The plain interior and the two-tone arches lend it a spiritual atmosphere, that many visitors miss in the upper church. 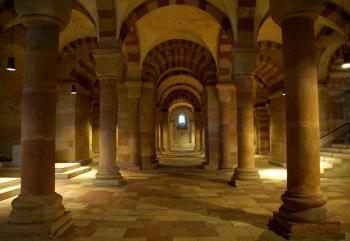 No doubt, it was in the crypt of the Speyer Cathedral where my fondness for Romanesque architecture has its origin. The western façade dominates the views from the city. The westwork is a new construction from the 19th century, art historians do not consider it very important, but it has a wealth of sculptures and ornament. I would recommend an audioguide, the meaning of the sculptures and the building history of the Cathedral is explained in detail. However figural decoration is not typical Romanesque and I prefer the eastern view to the apsis (as shown in the photo of Ian's review below). The plain interior of the cathedral is the result of the restoration in the 1950s when the most frescoes from the 19th century were removed, highly controversial among experts and often considered an inappropriate re-Romanization. The largest frescoes have been preserved and since 2012 they are shown in the 'Kaisersaal' in the westwork. The 'Kaisersaal' can only be visited with a guided tour (only April to October). Well, I like the plain walls better, but a good reason to join the tour is that afterwards you can climb the tower. Undeniable is the historical significance. The construction was started in the 11th century when the Salian dynasty ruled over the Holy Roman Empire. It was a demonstration of political power that such a huge cathedral was built in this tiny town, Speyer had only 500 inhabitants at that time. So the Cathedral is also a symbol of the conflict between Papacy and Emperor, Investiture Controversy and Walk to Canossa are keywords for that period. Even today the Cathedral appears oversized for the small town. When you're in Speyer you should also visit the mikveh and the remains of a medieval synagogue, just 200 meters from the cathedral. Both are parts of the tentative site “ShUM cities”. And for refreshment I recommend the Hausbrauerei Domhof with a lovely beergarden. I visited this WHS in September 2010. The basilica with 4 towers and 2 domes was founded by Conrad II in 1030 and is one of the most important Romanesque monuments from the time of the Holy Roman Empire. The highlight of my visit was the incredible panoramic view of the cathedral from on top of the old city gate. I was born in Germany and from 1950 to 1954 I lived in Speyer.I made my first Komunion and Konfirmation in the kaiserdome where I also was a Altarboy. I have lived in the US since 1956. When I visited germany for the firs time in September 2009 I vissited the Dome and I was dismayed as to what had been done to this great historic church.The inside is nothing like it was.It has been modernised,sanitized and sterilized of all that which made it a historical treasure. Even the Krypt which had been closed with two massive steel doors has been modernized. Very dissappointed. I am bemused by some of the remarks here. Speyer Cathedral is simply one of the great Romanesque buildings of western Europe, and - for anyone with any sensitivity at all for the style and the spirituality of the eleventh century - it is an incredible building, easily the peer of any other church of the period in Germany, France, or England. I do wonder, though, how many visitors have any knowledge of, or even care about, the turbulent history of the Salian dynasty which is so present everywhere in this building. The cathedral itself is not just a house of religion but a mighty fortress and a show of strength by an emperor on a collision course with the papacy. Henry IV, the great Salian emperor whose remains lie in the crypt, ended his days in humiliation after begging the forgiveness of Pope Gregory VII in the snows of Canossa, barefoot and dressed in sackcloth. It is one of the great dramatic moments in the history of the Western church, and Speyer was the front-line of the battle between pope and emperor. I have to say I was slightly disappointed by the Cathedral in Speyer. I had quiet high expectations of it as it is regarded as one of the finest Romanesque Cathedrals in Europe and this is a style I have bit of a fondness for. Whilst it certainly was an impressive bulk I didn't really feel any sense of awe, even upon entering the huge interior of the church. That said it was worthy of the trip from nearby Heidelberg. 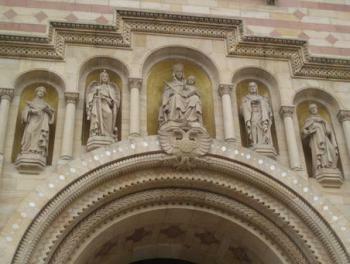 The exterior of the church was impressive and dominates the city. The main drag of Maximillianstraβe leads straight to its main entrance and the body of the cathedral is surrounded by parkland, which means you can really enjoy the exterior without it being cramped by its surroundings. As Els has stated it really is worth making a donation to head down into the crypt. The red and yellow striped arches were very reminiscent of the Mezquita in Cordoba. Also walking up the steps level with the altar really gives a great impression of the massive size of the cathedral. Speyer itself was a nice town and had a nice Christmas market when we visited, whilst the cathedral did not really match my expectations the façade is impressive and worthy of a trip if you are in the area. 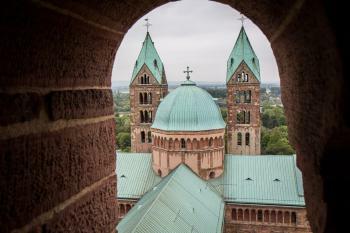 In my trip to Germany I have visited the beautiful Romanesque cathedral of Speyer, dedicated to Saint Mary and Saint Stephen. It was begun under the emperor Conrad I in 1030 and finished under Henry IV in 1106. In 1689, during the French occupation, the church was damaged by a fire and in the 18th century, the architect I.M. Neumann tried to reconstruct it in the Romanesque style, but he also added in 1772-1778 a Baroque western block. In 1805 there was a project for demolishing the church and transform the western block in a triumphal arch dedicated to Napoleon, but the building was saved by his wife, that visited the church in person. In 1854-1858 the western block was replaced by one in the Romanesque style, influenced by that time's ideas. In this period, all the interior was decorated by neo-Romanesque paintings and historical panels, attributed to Schrandolf and its atelier. Since 1957 the paintings and the painted plaster were removed for restoring its original aspect. The cathedral is the most important and largest Romanesque church of the German Empire and is characterized by the equilibrium of the eastern and western blocks, which frame the nave and the raised transept, therefore by the symmetry of the two towers and one dome of each block. The simple exterior has on the walls two rows of windows and one of columns, while the apse has a row of blind arches and one of normal arches. The narthex contains in the wall niches the statues of the four Salic emperors and four kings, which are buried here in tombs in the main of the three naves of the crypt, which has also three apses like the church itself. The interior of the cathedral contains columns with nice capitals, some of the frescos of 1846-1853 and two main altars at different heights on the stairs of the presbytery, over which is suspended an iron crown. I liked the cathedral very much because of its stunning architecture, but the interior doesn't have many works of art and it's interesting, like the exterior, almost only for its architecture. I think also that, although most of the 18th century frescos were removed, it can be done also for the remaining paintings and for one of the two main altars (which is modern), because they are in contrast with the original architecture of the church. Also the main façade is not original, but obviously there are not any possible solutions. I think that the cathedral is absolutely worth to be visited and justifies its inscription on the WHL. Of all the places I've been to and Cathedrals I've visited, this Cathedral and the quaint romanesque Speyer really took the prize. T'was absolutely breathtaking! I traveled abroad to live in a small town, Wiesloch Germany, just south of and on the outskirts of Heidelberg. I was just there 2 weeks when I first traveled on to Speyer. It was my first time there and although eary it felt as though I finally reached home. Everything was so peculiar and the architectural aspects, from the Cathedrals to the walk-bridges right down to the cobble-stoned streets and spirit about the town was absolutely breath-taking. I can't find better words to describe the town. I'm back in America and even feel homesick to go back. During my visit to the Cathedral I celebrated the most heart-warming Christmas (1998) where candles were lit. Months later, while strolling through the commons, I came upon statues of (what I thought to be) a King, Queen and Chester and took some photos. I didn't even think to write down the engravings and I'm trying to find information on this. If anyone happens to know or have info on the Statues (just around the corner from the Cathedral) I would LOVE to have this. It was just a very moving experience and if I had my "druthers" I'd move back in a heartbeat! This also is one of my favorite historic sites in Germany. The cathedral is just so, well, Romanesque! So free of all the gold and curly gew gaws of the later periods. The cathedral has a program of music, so you might be able to schedule a visit around a specific event. The Christmas market in Speyer was pretty nice, and they also have a pretzel festival every year (Brezelfest) with a parade. Yes, pretzels on parade! There is a a museum cattycorner across from the cathedral that is worth a visit, too. They have special exhibits: we saw a Jewish history exhibit that was one of the best I've seen in Europe. And stop in for tea at the museum cafe and its neat architecture. It's sort of hard to describe, but the cafe is inside the building, but outside the old building. So the old exterior wall has become the new interior wall of the cafe, and the ceiling is glass panels about 40 feet up, like a greenhouse. There is a touch of modern in this ancient architectural jewel, a large battery-driven floor sweeper was keeping the floor clean in a manner not envisioned by the original builders. A bit of a disappointment for those who expect gold, ornaments and whatnot. But eventually it's the vastness and the space inside that strike the visitor. Like being inside of a different universe. I had the pleasure of visiting Speyer several times during my tour of duty in Germany. The Cathedral is stunning; I hope to be able to see it completely restored to its original state. Remnants of the walls of the old city are still extant at various places around the basilica and they give you some sense of how important the church was in this city. The best view of the church? From the bridge across the Rhein River you can see this large, yet simple church on the hill fits into the geography of the town around it. 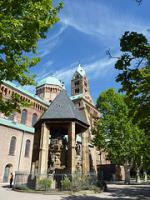 You also have a great view of the other beautiful churches in Speyer. After the Koelner Dom, this was my absolute favorite building in Germany. Holy Roman Empire: Built by Conrad II (c. 990 - June 4, 1039), Holy Roman Emperor from 1027 until his death and representative of the Salian dynasty.